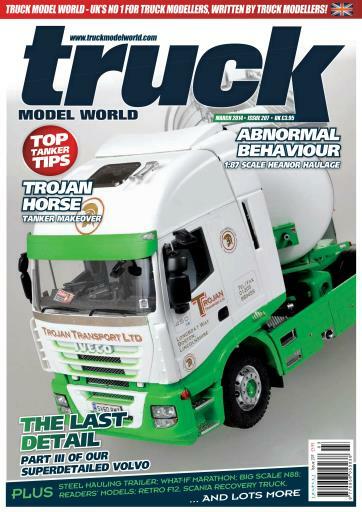 Our main feature this month is a much modified 1:24 scale road tanker, coupled to an Iveco Stralis. Our Northern Hauliers series continues with a scratchbuilt trailer in the fleet of Bassett’s, and another famous fleet is replicated in 1:87 scale – Heanor Haulage. European companies are not left out, there’s an MAN from German operator Adalbert Wandt and a Scania recovery truck from the Danish Falck organisation. 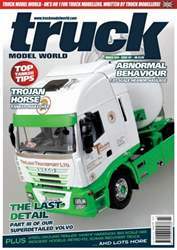 For Volvo fans we’ve articles on backdating an F12 to an earlier type, the third part of our Volvo upgrade series, and a 1:8 scale Volvo N88. There’s a radio control collection, an MAD 8x4 Scania, a ‘modern’ Marathon and some 1:50 scale features. All to be found in the March issue of TMW.